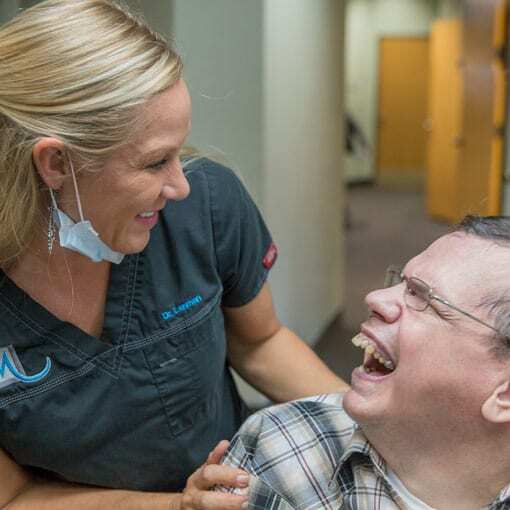 Masterpiece Smiles provides expert, caring treatment for patients with special needs. Our dentists and staff fully understand the demands of special-needs care and we welcome these patients and their families. Some disabilities can make it difficult, or even impossible, to maintain good oral hygiene. For people living with disabilities, even tasks like brushing their teeth, can be problematic. This inability to take care of one’s teeth increases the likelihood of tooth decay and gum disease. Dental health affects overall health. Therefore, it is extremely important for your loved one to go to the dentist, which means finding ways to make the experience less troublesome by finding a dentist for special needs patients. A special needs patient may require a dentist who accommodates those special needs. Dental patients who suffer from a stroke, Multiple Sclerosis, Alzheimer’s disease, autism, Down’s Syndrome, cerebral palsy, genetic disorders, paralysis and even arthritis can need a little extra dental care to ensure they can maintain optimal dental health. Experience in working with the mentally and physically disabled. Special sedation alternatives to aid with our special needs patients. Doctors and a support staff who welcome the challenges of their unique dental problems. Many patients with special needs are afraid of dental procedures, and may have had past treatment while under general anesthesia. This can mean their fears are very difficult to ease and appointments can be challenging for both the patient and the provider. Our dentists and staff focus on the individual needs of each patient. Masterpiece Smiles provides dental care for patients with physical, developmental, cognitive, sensory, behavioral or emotional special needs. Our team has the experience and increased awareness, attention and accommodation to provide genuine empathy and the best care for your loved one with special needs.